Vruchtentaart met vla ... it's Dutch for fruitcake with custard, for if I should call it fruitcake, one would expect the old English classic. Not this one, though. 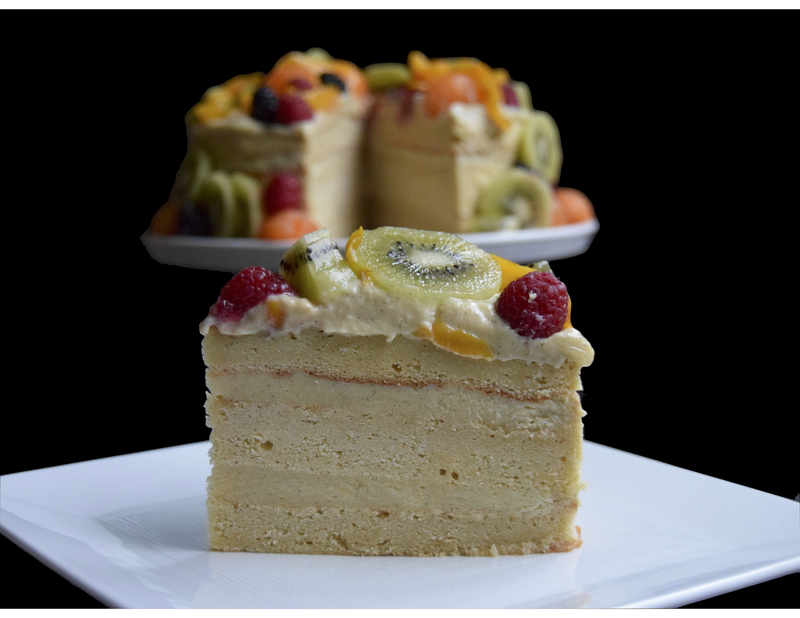 This is a refreshing summery cake, enriched with cool thick custard and accented with summer's bounty: kiwis, strawberries, blackberries and canteloupes. Tante Lily came to cook in our place one day and made a cake such as this for Mama's birthday, one of the many desserts for the buffet. 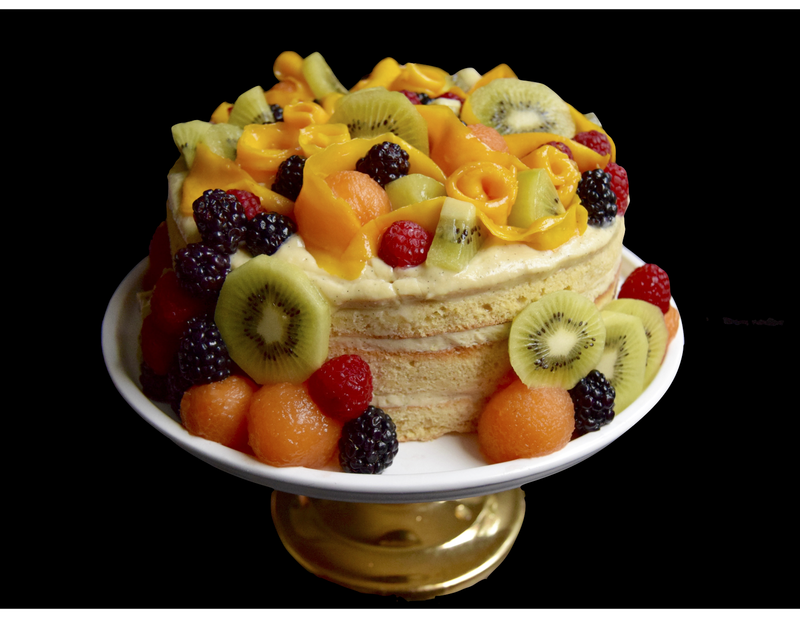 This cake stole the show, not only because it was light and fruity, desirable qualities of desserts in the tropics, but also because it was decadent in its own way, rich with custard, unlike the many other buttercreamed cakes on the table. 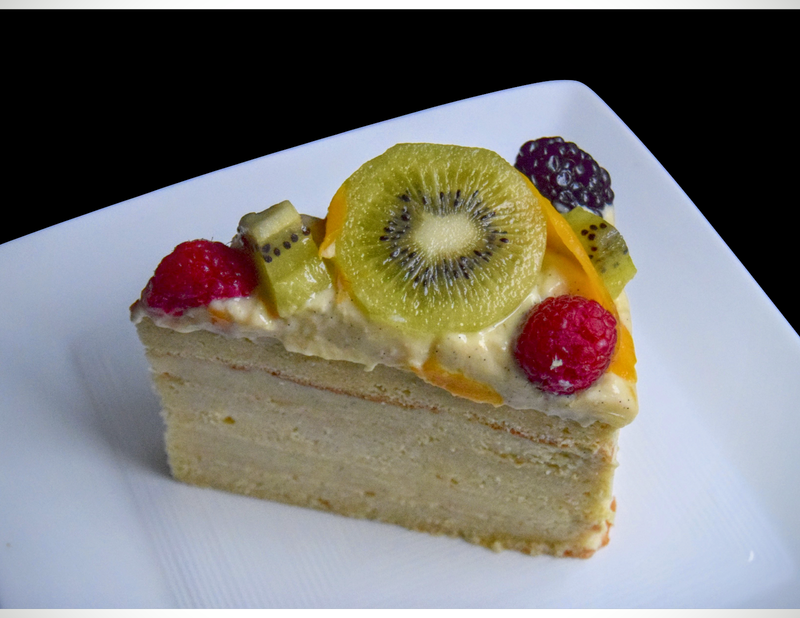 The cake recipe is a rich and dense one. While you can choose a lighter vanilla cake, there are merits to pairing this decadent cake with fruity accompaniments. 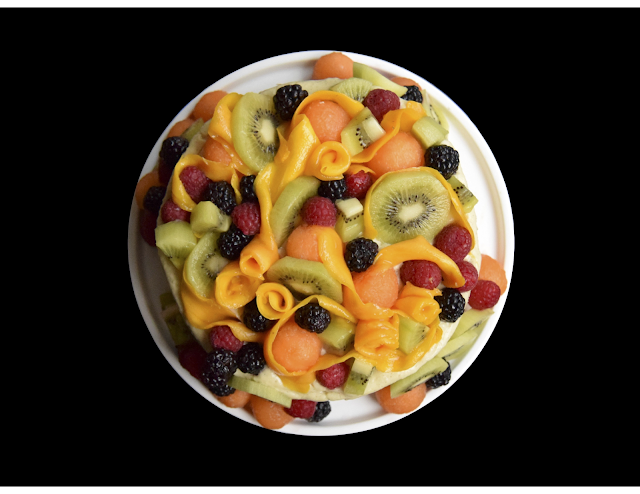 As for the choice of fruits, you can just about play with the possibilities. Stone fruits, melons and berries are excellent options. But I draw the line at apples, bananas and citrus fruits, just don't go there. And who's to say you can't have an all-berry or an all-peach cake. 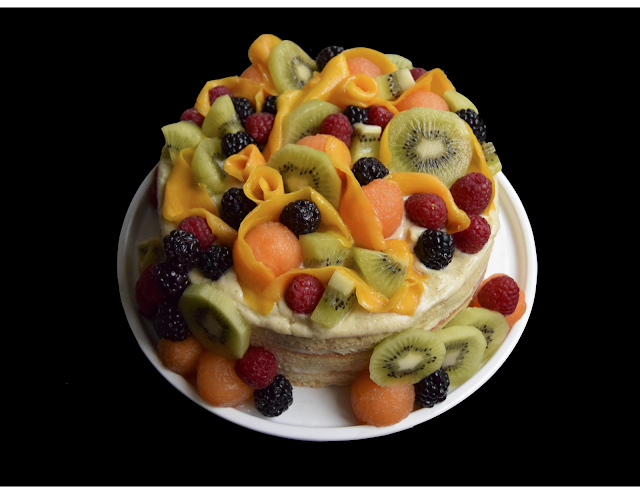 There is a light coating of agar on top of the fruits which serves to plant the fruits firmly on the cake, preventing an avalanche as you slice into it, and also to prevent the fruits from drying out and discolouring. You definitely want to start making the agar after the cake has been fully assembled. It's an added bother, but will definitely extend the aesthetics of your baked good. Whether for a summer birthday, a garden party, or any festivity, you can be sure this vruchtentaart will be as beautiful as it is unique. 1. In a saucepan, boil custard powder and milk. 2. Add vanilla and sugar, stirring constantly. 3. When done, turn off heat and cool in a larger pan filled with cold water, keep stirring so as not to set the custard. Make agar only when cake is assembled. 1. In a small saucepan, combine agar with cold water and sugar. 2. Cook till it boils. 3. Turn off the heat, keep stirring so it doesn't coagulate. 4 cups of cut peaches, plums, cherries, pineapples, strawberries, blueberries, or the like. 1. Invert one cake layer onto a serving platter. 2. Spread a little less than a third of the custard on top. 3. If desired, place half a cup of fruit (diced small) on the top of the custard. 4. Top with the second cake layer. 5. Repeat layering with the same amount of custard earlier and optional fruit. 6. 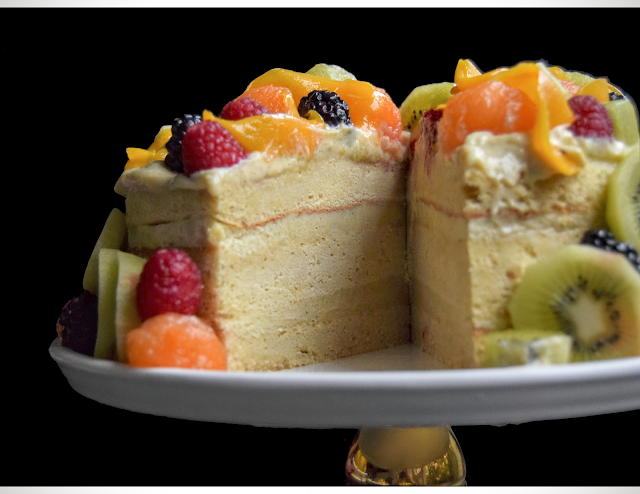 Place the last cake layer on top. 7. Pour and spread the rest of the custard on top, letting it drip over the sides. Work quickly, this stuff can set and thicken. 8. Arrange the rest of the fruit on top of the custard. 9. At this time, the agar glaze can be made, stir to cool, then slowly pour on top of the fruit and to the sides to set the fruit and prevent them from discolouring. 10. Refrigerate a few hours or overnight.